AC Removals and Storage has a large level site next to Lands End Airport that allows us to offer a flexible range of storage solutions. 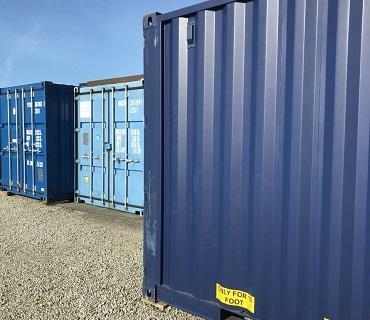 We offer our clients storage options up to full size containers with periods from one month to open ended. We offer storage options from as little as £12 per week and our self-storage containers start from just £18 per week. These containers are up to 20 feet long and can accommodate a huge amount of furniture and possessions. These containers can even be used for car storage if you have a vehicle that you want to protect from the elements. Our storage units are located within a secure building and are accessible by appointment only. Our self-storage containers are incredibly strong and we recommend our clients buy their own container lock (inexpensive) to ensure they alone have the keys. All our storage facilities are dry and secure and our clients have the added reassurance that we live on site for added security. Our storage options are easy-in/easy-out with terms running from just one month through to open ended. We can store single items through to full house loads. If you have a special storage requirement such as a boat or caravan then contact us – we will always try to help. Call or email to have a friendly chat so that AC Removals and Storage can meet your storage needs.